This stylish alarm panel with backlit LCD mounts to the wall and can be controlled via its keypad, supplied with a key-fob remote or control it from your Smartphone using the freely available 'Smart Halo' App. The included PIR motion sensor and two door/window sensors are battery powered and transmit wirelessly to the panel from up to 100m away (open area). Once the system detects a security breach, indicator lights will flash and the built-in 120dB siren will become active. If you connect the panel to a telephone socket (2m cable included) the panel can automatically dial up to 8 phone numbers and play a pre-recorded message that you record yourself. After the message plays the recipient can disable the alarm, or communicate with the intruder or person in distress in the house using the microphone and speaker built into the panel. Other features include 4 operating modes (Standby, Armed, Alert and Home) and battery backup. 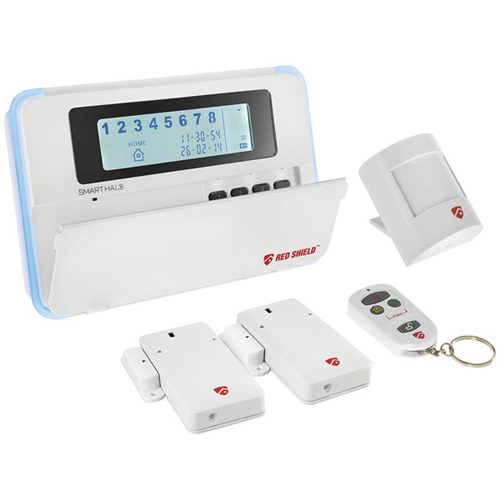 Easily expand the system with additional sensors and accessories available separately.